Define Fees by Billing & Due Date Calendar. This function allows the users to determine the percentage of the specific fees due to be paid by a particular time of the month. This function will be use to define the fees by Billing and Due Calendar. Navigate to Main Menu > Setup SACR > Product Related > Student Financials > Tuition and Fees > Billing and Due Calendars. Enter the values in the SetID and Due Date Code field. Note: The Due Date Code should be the short form name of the month. Example: Due Date for the month of January as 'JAN' in short form. You will be directed to the Billing and Due Calendars page. Enter the values in the Description, Short Description, Pivot Date and Term fields. Description: The description of the created Due Date Code, usually captures the name of the Month for the particular page. Short Description: The short description of the created Due Date Code. Pivot Date: The starting place to calculate due dates or billing dates. 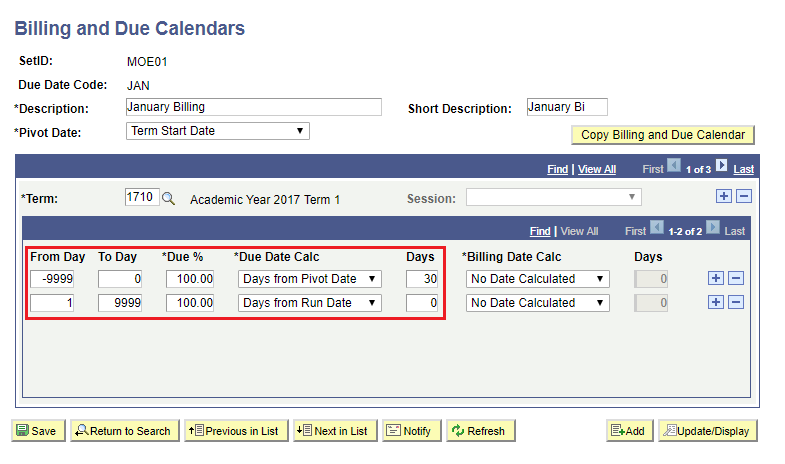 The system counts the billing dates and due dates - either back in time or forward in time - from the pivot date that you select. Term: The term for this billing and due calendar. Note: Make sure the required field are not empty: Description, Short Description, Pivot Date and Term. Fill in the values in From Day, To Day, Due %, Due Date Calc and Days fields. Note: The days of the Due Date should be set depends what the MOE required. Also click the '+' button to add another row of fields. From Day: The first day that assess the fees. Express the number of days before the pivot date as a negative number. To Day: The last day that assess the fees. Express the number of days after the pivot date as a positive number. Due %: The percentage of the fee that's due for the respective assessment period. 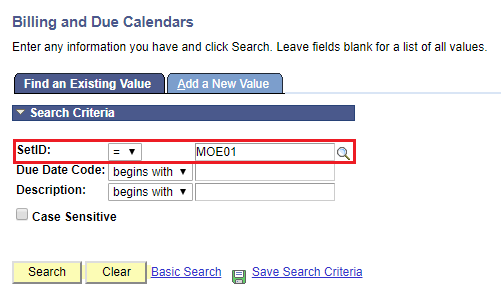 Days from Pivot Date: Select to calculate the due date based on the pivot date. Days from Run Date: Select to calculate the due date based on the day that you assessed fees. 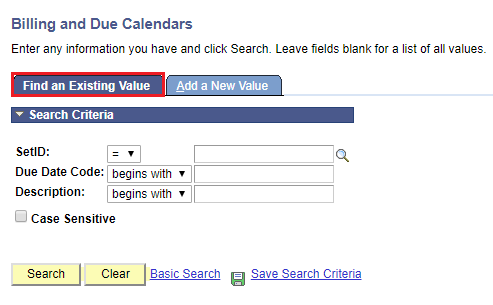 No Date Calculated: Select to disable the calculation of a due date. Days: Enter the number of days from the due date, pivot date, or run date that the system produces a bill. Enter a negative number to indicate days before the respective date; enter a positive number to indicate days after the respective date. 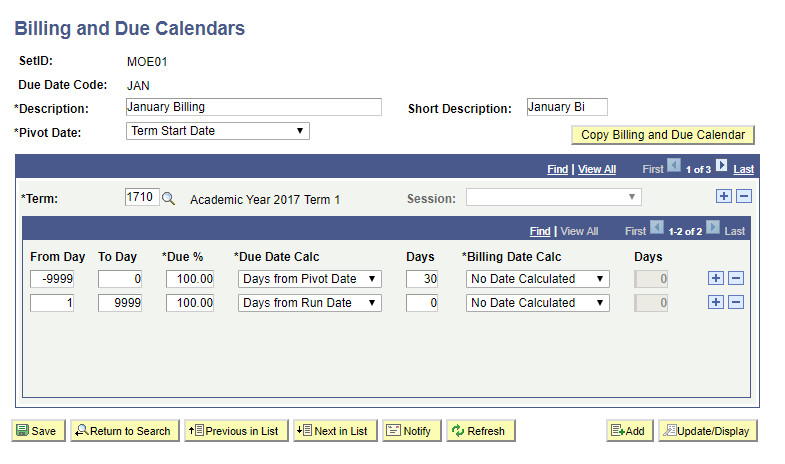 If you select No Date Calculated in the Billing Date Calc field, the Days field becomes unavailable. Note: Make sure the required field are not empty: From Day, To Day, Due % , Due Date Calc and Days. Note: Billing Date Calc: Use this field to determine how the system calculates the billing date for a given fee assessment period. This function will be use to copy the fees by Billing and Due Calendar. Enter the values in the SetID field tab. Note: Make sure the required fields are not empty: SetID. 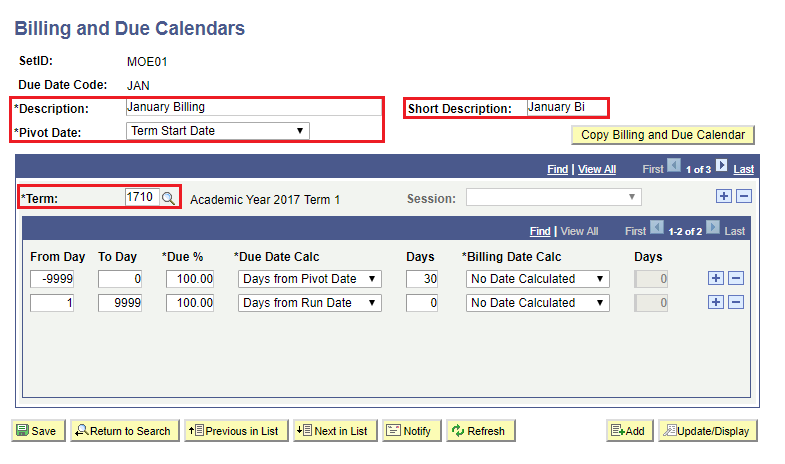 Click the Copy Billing and Due Calendar button if you want to copy the Term for the due's you created for a new term. A Enter From and To Term / Session window will pop out. 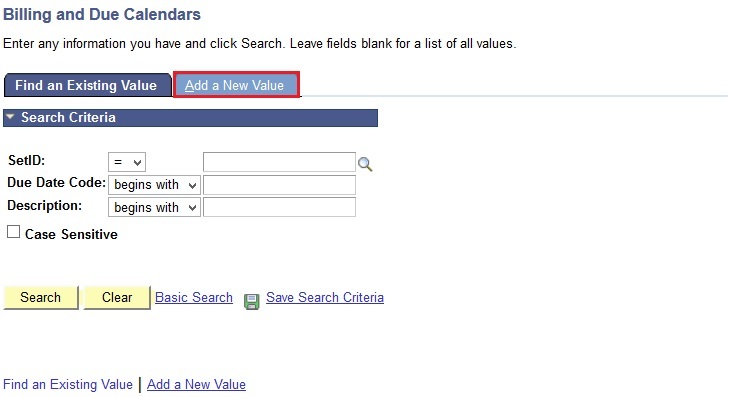 Enter the value in the From Term field for which new term you want to create, and enter the To Term for the new term. Click the OK button after finish entering the values. Note: The due date information you entered for the previous term will be copied and carried over to the new term.